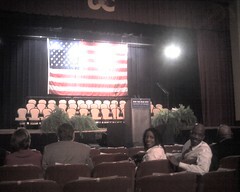 Everyone's waiting in anxious anticipation for Senator Obama to arrive and speak at 11:00 am. He's going to speak on ending the war and investing at home. Sent from my Treo 700p cell phone.